Tetra Koi Vibrance meets the exact requirements of Koi which are kept in the U.S. climate. They provide a completely natural and nutritional diet, but contain a higher protein level and a natural color enhancer to keep Koi as active, healthy, and colorful as nature intended. A highly nutritional diet that brings out vibrant reds and yellows on Koi and ornamental goldfish. MIN. PHOSPHORUS 1.0% MIN. ASCORBIC ACID (VIT.C) 99 MG/LG. Koi Vibrance - enhances natural coloration. Koi need a special combination of proteins, vitamins, and minerals to achieve maximum growth in your water garden. TetraPond Growth Food for Koi has been specifically created from painstaking research to stimulate streamlined growth, as well as looking after the Koi's general well being. It is a particularly good food during the warm summer months when the fish are able to grow more quickly. Use together with TetraPond Koi sticks to achieve a perfect combination of speedy growth and dazzling coloration in your Koi or pond fish. MIN. PHOSPHORUS 0.6% MIN. ASCORBIC ACID (VIT.C) 97 MG/LG. The gel based block will feed all pond fish for up to 7 days, without clouding water. 15 -20 Goldfish or 2-3 Koi per block for a 7 day period. Consistent, uncompromising quality and beautiful results in the aquarium have made TetraMin the worlds favorite tropical fish food. *Compared with former TetraMin the new formula improves food utilization and minimizes fish waste - guaranteed. This wheat germ based food is recommended for Spring and Fall temperatures. Wheat Germ's exceptional digestibility at low temperatures is very important since fish metabolism and the pond's ammonia-reducing biological activity are greatly diminished in colder months. Feed in spring and fall, when water temperatures are below 50°F and above 39°F. MIN. PHOSPHORUS 1.0% MIN. ASCORBIC ACID (VIT.C) 97 MG/KG. Aquascape Premium Staple Fish Food Pellets are formulated for everyday use and provide your fish with the nutrition they need to thrive at an affordable price. All Aquascape fish foods contain probiotics that aid in digestion and reduce fish waste, while the high-quality protein included helps to optimize growth rates. The floating pellets contain stabilized vitamin C and other quality ingredients and are scientifically formulated for all pond fish, including koi and goldfish. Aquascape fish food will not break apart during feeding, helping to maintain clear water conditions. Crude Protein 32% min. Crude Fat 3% min. Crude Fiber 4% max. Moisture 10% max. Ash 12% max. Calcium 0.8% min. Phosphorus 0.6% min. Vitamin A 3,000 IU/kg min. Ascorbic Acid (Vitamin C) 50 mg/kg min. Vitamin D3 600 IU/kg min. Vitamin E 65 mg/kg min. Medium - For fish measuring 1"-10"
Aquascape Premium Color Enhancing Food Pellets are specially formulated to promote brilliant coloration in your fish and provide them with the daily nutrition they need to thrive. All Aquascape fish foods contain probiotics that aid in digestion and reduce fish waste, while the high-quality protein included helps to optimize growth rates. The floating pellets contain stabilized vitamin C and other quality ingredients and are scientifically formulated for all pond fish, including koi and goldfish. Aquascape fish food will not break apart during feeding, helping to maintain clear water conditions. Crude Protein 40% min. Crude Fat 4% min. Crude Fiber 3% max. Moisture 10% max. Phosphorus 0.8% min. Vitamin A 9,000 IU/kg min. Ascorbic Acid (Vitamin C) 150 mg/kg min. Vitamin D3 1,800 IU/kg min. Vitamin E 180 mg/kg min. Aquascape Premium Cold Water Fish Food Pellets are specially formulated for cold water conditions and provide your fish with the nutrition they need to thrive at an affordable price. This cold water fish food contains wheat germ, making it ideal for use in water as cold as 50 F. All Aquascape fish foods contain probiotics that aid in digestion and reduce fish waste, while the high-quality protein helps to optimize growth. Contains stabilized vitamin C and other quality ingredients and are scientifically formulated for all pond fish, including koi and goldfish. Aquascape fish food will not break apart during feeding, helping to maintain clear water conditions. Crude Protein 38% min. Crude Fat 4% min. Ascorbic Acid (Vitamin C) 230 mg/kg min. Vitamin D3 1,800 IU/kg min. Aquascape Premium Flake Fish Food provides easy consumption by smaller fish and fry, while the inclusion of plankton and shrimp meal makes it irresistible to all pond fish. Aquascape Flake Food will also help to promote brilliant colors in your fish. All Aquascape fish foods contain probiotics that aid in digestion and reduction of fish waste, while the high-quality protein included helps to optimize growth rates. This easily-digested flake food contains stabilized vitamin C and other quality ingredients and is scientifically formulated for all pond fish, including koi and goldfish. This diet is simply a mixture of the mini and large pellet growth foods. Designed for pond owners with mixed sizes of fish in their ponds. Packaged in two, five, fourteen, twenty five and fifty pound bags. Mini pellet size is 1/8" and large pellet size is 3/16". This diet contains the same ingredients as the growth food but we've added three proven color enhancers, marigold extract, spirulina, and canthaxanthin. Feed this food for 30 days and watch the reds on your koi and goldfish intensify. This food is available in the large pellet only 3/16" size pellet. A year-round diet formulated to produce maximum growth with minimum waste. Available in two pellet sizes, 1/8" mini pellet for fish under five inches and a 3/16" large pellet for fish over five inches. Packaged in two, five and twenty five pound bags. Silkworm Selects offers your koi the highly desirable benefits of silkworm without the negative impacts common with other silkworm-type products. The extreme silkworm content offers a supplemental food, rich in natural lipids and proteins, offering your koi the building blocks they require for superior 'traditional' growth and 'true koi' conformation. Feeding Suggestions: Regularly monitor your temperature and adjust feedings as required. Never over feed. Above 68°F - Silkworm Selects should comprise 20% to 40% of total amount fed and be mixed with the other Hikari koi diets. Using this mix, feed 2 to 4 times per day the amount your fish will consume within 5 minutes. Below 68°F - We strongly recommend using Silkworm Selects primarily as a treat comprising no more than 10% of the total amount fed. For colder temperatures we recommend Hikari Wheat-Germ. Note: Silkworm Selects contains higher levels of natural ingredients which may cause a slight change in color from one production lot to another. Rest assured because of our rigid quality standards, each package meets our superior nutritional specifications. Extensive research into the eating habits and living conditions of koi provided us with the knowledge to develop Hikari Economy . This economical, daily diet for koi and other pond fishes will provide them with the basic nutrition they require to live a long and healthy life. Hikari® Economy provides little or no color enhancement. Will Not Cloud The Water. Floating Pellet: Allows easy monitoring of amount eaten; Helps eliminate over-feeding; Reduces water quality problems; More Economical. Contains Stabilized Vitamin C: Promotes resistance to stress; Promotes resistance to infectious disease; Promotes a long, healthy life. Excellent Daily Diet: Great basic nutrition; No color enhancing capacity. Feeding Suggestions: When water temperature is consistently above 60°F, feed one to two times daily. When water temperature is consistently above 70°F, feed two to four times daily. Please do not exceed the amount your fish will eat within three to five minutes of feeding. Remove all remaining food after the feeding period to avoid over-feeding and the water quality problems which can result from this action. Hikari Staple is an economical, daily diet for koi as well as other pond fishes. It contains all the basic nutrition your fish need to live a long and healthy life. High in stabilized vitamin C, Hikari Staple promotes resistance to stress and immunity to infectious disease. Reduces water quality problems; More Economical. This economical, daily diet for goldfish and koi fry will provide them with the basic nutrition they require to live a long and healthy life. Extensive research into the eating habits and living conditions of goldfish and baby koi provided us with the knowledge to develop Hikari® Goldfish Staple™. This economical, daily diet for goldfish and koi fry will provide them with the basic nutrition they require to properly develop. Hikari Spirulina is a superior color enhancing formula using natural color enhancing ingredients extracted from pure, cultured spirulina and carotenoid NS germ which when blended together produce this outstanding diet. Floating Pellet That Will Not Cloud The Water: Allows easy monitoring of amount eaten; Helps eliminate over-feeding; Reduces water quality problems; More Economical. Color Enhancement: High in pure, cultured spirulina, a natural color enhancer; Rich in NS germ; Brings out the most vibrant, natural colors; Will not affect the white areas of the fish; Will add beauty and luster to the skin. Excellent Daily Diet: Outstanding nutrition; Easily digested; Promotes championship form and color. Feeding Suggestions: When your water temperature is consistently above 70°F, feed two to four times daily. Warmer temperatures translate to more activity and the need for more food. Always remove all remaining food after the feeding period to avoid over-feeding and the water quality problems associated with this action. Hikari Gold is a daily diet, developed through years of koi breeding and showing, to meet the nutritional needs of koi while providing excellent color enhancement. Hikari Gold will bring out the best in your koi and bring you the success you've dreamed of! Excellent Daily Diet: Outstanding nutrition; High protein levels; Improved growth rates & form. Feeding Suggestions: When your water temperature is consistently above 60°F but below 70°F, feed one to two times daily. When the water temperature stays above 70°F, feed two to four times daily. Warmer temperatures translates to more activity and the need for more food. Always remove all remaining food after the feeding period to avoid over-feeding and the water quality problems associated with this action. Hikari Hi-Growth is a powerful, supplemental diet specially developed to promote championship form in koi. Kamihata Fish Industries, Ltd., Japan's premier breeder of koi, combines over a century of experience with the latest scientific techniques to produce Hikari Hi-Growth . This advanced diet, full of proteins, vitamins and minerals in perfect balance, increase your koi's gloss and luster, as well as their overall size and weight. Excellent Daily Diet: Extreme nutrition; Vacuum packed for maximum freshness; Helps build both size and weight faster than any other food without deformities. Feeding Suggestions: When your water temperature consistently exceeds 70°F, feed up to four times daily no more than your fish will consume within three to five minutes. Always remove all remaining food after the feeding period to avoid over-feeding and the water quality problems associated with this action. When fed with Hikari Spirulina, you can expect your koi's body to develop superior color with splendid luster and brilliance. Hikari Excel is a scientifically developed, color enhancing diet. An easily digestible food produced from a mixture of highly nutritious wheat-germ and pure cultured spirulina. After a month of daily feeding it can produce ideal coloration of your koi. Hikari® Excel , simply the best! Color Enhancement: High in pure, cultured spirulina, a natural color enhancer; Rich in vitamin E derived from select wheat-germ; Promotes rapid color enhancement; Helps develop extraordinarily glossy appearance and luster to the skin; Great for use prior to showing koi. Excellent Daily Diet: Superior nutrition; Easily digested and assimilated; Promotes balanced growth and full natural potential. Feeding Suggestions: Feed up to four times daily based on your water temperature and koi activity level. Warmer temperatures translate to more activity and the need for more food. Feed no more than your fish will consume within three to five minutes. Always remove all remaining food after the feeding period to avoid over-feeding and the water quality problems associated with this action. A highly nutritious, easily assimilated, highly digestible daily diet for baby through adult koi. Developed through many years of breeding experience, this highly nutritious diet is extremely effective in cooler climates which experience a winter season. Excellent Daily Diet: Superior basic nutrition; Natural enhancing capacity; Superior Growth Rates; Improved Brilliance & Luster To Skin; Can Be Used With Hi-Growth & Gold For Improved Performance. Feeding Suggestions: When water temperature is consistently below 40°F degrees, stop feeding. Once water temperature is consistently above 40°F, but below 60°F, feed once daily. If water temperature is consistently above 60°F but below 70°F, two times daily during the warmest part of the day. When water temperature is consistently above 70°F, feed two to four times daily. Warmer temperatures bring more activity which requires more food. Please do not exceed the amount your fish will eat within three to five minutes of feeding. Remove all remaining food after the feeding period to avoid over-feeding and the water quality problems which can result from this action. Saki-Hikari has been developed as a result of decades of first hand breeding experience and considerable insight from a number of Japan's top breeders. Saki-Hikari is the diet used by the All Japan Koi Show Grand Champion winners in back to back shows dating back to 2003. If you want the VERY best for your koi, look no further than the leader in koi nutrition worldwide, Hikari! Provides the proper level of nutrients and carotenoids to provide steady growth and improved coloration. Excellent growth and coloration possible. Can be used down to 50°F. Hikari Saki-Hikari has been developed as a result of decades of first hand breeding experience and considerable insight from a number of Japan's top breeders. Saki-Hikari is the diet used by the All Japan Koi Show Grand Champion winners in back to back shows dating back to 2003. If you want the VERY best for your koi, look no further than the leader in koi nutrition worldwide, Hikari. No negative impact to the Siroij. Use in water temperatures above 68°F. A supplemental floating diet intended to help finish championship-grade koi prior to a show. If your koi needs an extra pop of color, this probiotic enhancing diet should be your first choice! For best results use Saki-Hikari Deep Red when your water temperature is consistently above 20°C (68°F). As this diet offers an extreme color enhancing effect it is meant to be used as a supplemental feed only. Remember, higher levels of Saki-Hikari Deep Red will provide more aggressive color enhancement and exclusive feeding of Saki-Hikari Deep Red may cause discoloration on the Shiroji (white areas of the koi). A professional use, supplemental daily diet intended to help finish the Shiroji (white) of your championship-grade koi while enhancing the depth and brilliance of the skin. FEEDING: Use of Saki-Hikari Pure White with our other Saki-Hikari diets is recommended to experience the maximum Hikari Germ effect. The use of color enhancing diets will reduce the impact of Saki-Hikari Pure White. Above 64°F - Feed two to four times daily based on the activity level of your koi. Between 54°F and 64°F - Feed two to four times daily based on the activity level of your koi. For best results, try to feed during the warmest part of the day. Between 41°F and 54°F - Carefully regulate the amount fed based on the activity level of your koi and your pond conditions. Extreme care should be taken to avoid over-feeding in this temperature range. ALL-SEASON is an excellent year-round source of easily assimilated marine and vegetable proteins, as well as vitamins C and E. Spirulina and shrimp meal give this formula both mild color enhancing property and a moderately high protein content, making it especially great for colder weather when koi's metabolism is less active. As with all other Dainichi koi foods, the addition of calcium montmorillonite clay and un-cooked digestive enzymes give ALL-SEASON an unmatched digestion rate. Enhanced with vitamins and minerals essential to healing skin blemishes and abrasions, ALL-SEASON will maintain your koi in their top form. Usage: 1 to 3 times daily, feed your fish as much as they will eat for five to ten minutes in temperatures of 50°F to 60° F or more. In colder climates ALL-SEASON is an ideal food from late fall to early spring. Crude Protein 39% min. Crude Fat 6% min. Crude Fiber 4% max. Moisture 9% max. Crude Ash 8% max. Calcium 2% min. Dainichi's APG Mix consists of a rich medley of our most popular koi foods. Designed to take advantage of the best features of each of our formulas, this three-way mix combines the year round use of All-Season, show-readiness of Premium, and the intense growth potential of Growth Plus. Dainichi APG Mix enables koi keepers to satisfy the absolute widest array of their prized koi's needs. PREMIUM is an overall color, growth, and maintenance food. It can be used alone or in conjunction with other more specialized formulas like GROWTH PLUS or PRIMARY. PREMIUM combines a perfect balance of color and growth, and is an ideal food for keeping your koi in show quality condition. Featuring five sources of protein, of which spirulina, krill, and shrimp meal are also color enhancing, this formula is an all-time favorite with serious hobbyists and many top Japanese koi breeders. A two-step application of vitamins and minerals, especially vitamins C & E ensures that luster, sheen and white are at their best. The addition of calcium montmorillonite clay, garlic and fully active, un-cooked digestive enzymes, makes this formula virtually un-beatable in terms of digestion and performance. GROWTH PLUS contains a unique blend of montmorillonite clay, white fish meal, krill, and shrimp . This formula provides your fish with a high amount of marine protein which promotes both rapid growth and color enrichment. GROWTH PLUS also features an appetite-enhancing nutritional coating containing calcium montmorillonite clay and un-cooked digestive enzymes which facilitate the highest degree of digestibility. Growth Plus will not foul the filter or water. It is suggested for use during the warmer or high growth months. Usage: In temperatures of 60°F and above, feed fish as much as they will eat in 5-10 minutes, 2 or more times daily. Crude Protein - 39% min. Crude Protein - 42% min. Crude Protein - 44% min. Crude Fat - 6% min. Crude Fat - 6% min. Crude Fat - 7% min. Crude Fiber - 4% max. Crude Fiber- 4% max. Crude Fiber - 5% max. Moisture - 9% max. Moisture - 9% max. Moisture - 9% max. Crude Ash - 8% max. Crude Ash - 8% max. Crude Ash - 8% max. Calcium - 2% min. Calcium - 2% min. Calcium - 2% min. Phosphorous - 0.7% min. Phosphorous - 0.7% min. Phosphorous - 0.7% min. COLOR INTENSIFIER is highly enriched with pure cultured spirulina , montmorillonite clay and krill . This formula contains all-natural color enhancers, minerals and nutrients designed to enhance the color and luster of your koi. COLOR INTENSIFIER promotes optimum color in a short period of time, while providing your fish with a high protein, well balanced diet that maintains overall health and beauty. This is our most potent show formula, and we suggest that it is used for not more than 3 - 4 weeks at a time, during the summer or high growth months. Like all of our formulas, the supplemental coating features vitamins, digestive enzyme and color enhancers in their natural, un-cooked state resulting in an unmatched degree of potency. Usage: 1 to 2 times daily, feed your fish as much as they will eat in five to ten minutes in temperatures of 70° F or more. Crude Protein 41% min. Crude Fat 6% min. Crude Fiber 5% max. Moisture 9% max. Crude Ash 9% max. Calcium 2% min. Usage: Feed your fish 1 to 2 times daily, as much as they will eat in five to ten minutes in temperatures of 65°F or more. Crude Protein 44% min. Crude Fat 7% min. Usage: 1-3 times daily, feed your fish as much as they will eat for five to ten minutes in temperatures of 60° F or more. Premium is ideal for feeding from spring to fall in temperate climates. In areas that have no noticeable winter, this formula can be fed year-round. Crude Protein 42% min. Crude Fat 6% min. COLOR PRO is a premiere color food intended to enhance both the beauty and the physical conformation of Koi. Utilizing an optimum blend of Antarctic krill and 100% cultured spirulina, this formula brings out bright, vivid red colors in Koi varieties such as Kohaku, Sanke or Showa. COLOR PRO can be used alone or, preferably in conjunction with our All-Season or Growth Plus formulas. Usage: 2 or more times daily, feed your fish as much as they will eat in five to ten minutes in temperatures of 65°F or more. Crude Protein 41% min. Crude Fat 4% min. PREMIUM PRO is a balanced all-purpose color, growth and maintenance food, which can be used alone or in conjunction with our other formulas. This robust blend of krill, spirulina and white fish meal noticeably enhances the luster, sheen and white of your Koi. The addition of montmorillonite clay provides an additional source of minerals (including Calcium) for enhanced growth and digestion. Usage: 2 or more times daily, feed your fish as much as they will eat in five to ten minutes in temperatures of 60°F or more. Crude Protein 42% min. Crude Fat 4% min. Crude Fiber 3% max. Moisture 9% max. Laguna All Seasons floating fish food contains a balanced nutritional formula for all pond fish. This balanced blend of vitamins, minerals and amino acids are perfect for everyday feeding during the warmer months of the year. Formula contains a minimum of 32% protein. Laguna Color Enhancing formula contains a special blend of the highest quality proteins, vitamins and minerals to promote rapid color enhancement. Laguna Color Enhancing foods contain Spirulina and Stabilized Vitamin C to bring out vibrant colors in Koi. This floating fish food is designed for premium nutrition for growing show-quality Koi. Laguna Growth floating fish food contains a special blend of the highest quality proteins, vitamins and minerals to promote rapid growth. Laguna Growth Food also contains very high levels of protein ingredients for rapid growth and increased health. Laguna Wheat Germ floating fish food is designed for the cooler months of the year. This wheat germ formula is easily digestible and perfect for transitioning koi and goldfish into and out of the colder months. This formula contains a minimum of 28% protein and will not cloud water. Tetra Pond's Pond Color Sticks provide your fish with the nutrients needed to support overall health and vitality. This nutrient-rich formula helps enhance the natural colors of your Koi. TetraPond Flaked Food is a high quality diet in flaked form. Feed in conjunction with TetraPond Floating Food Sticks to give your fish a change. TetraPond Flaked Food is an ideal diet for smaller fish in your pond and can be fed whenever water temperatures are above 50°F. The primary meal for goldfish and small Koi. Tetra Color Flaked Food is a high quality color enhancing diet in flaked form. This food is formulated to create superb fish coloration by bringing out the vibrant reds and yellows. Tetra Color Flaked Food is an ideal diet to enhance the color of the smaller fish in your pond and can be fed whenever water temperatures are above 50°F. These baby pellet are specially formulated to bring out the vibrant colors in goldfish and baby koi. Rich in carotene, an easily assimilated color enhancer, Goldfish Gold starts your pet off right during that all important first year. The carefully balanced nutrients and vitamins will keep your aquatic pet healthy and full of energy. After only a short time feeding Hikari Goldfish Gold, your goldfish or baby koi will begin to look their best. Hikari Goldfish Wheat-Germ is an easily assimilated, highly digestible daily diet for goldfish, baby koi and large tropical fish. Developed through many years of breeding experience, this highly nutritious diet will keep your aquatic pet healthy and happy for years to come! Hikari Lionhead has been scientifically developed to promote growth and the prominent lionhead shape of goldfish such as Ranchu, Oranda and Azumanishiki. These lionhead goldfish have a rare and exquisite beauty which makes them the elite class of all goldfish. Belief that natural, live foods were indispensable in creating the desirable lionhead shape were rebuffed after our long and strenuous laboratory research. Feeding Suggestions: Feed two (2) or four (4) times daily, but do not exceed the amount your fish will consume within about a minute. Always remove any uneaten food after the feeding period to avoid over-feeding and the water quality issues that can result. When the water temperature is consistently below 50ºF or above 86ºF, reduce the amount fed based on the activity level of your fish and condition of your aquarium. Hikari Oranda Gold is a food developed specifically to promote prominent head growth while enhancing the coloration of goldfish kept indoors where adequate UV rays are not available to help them formulate colors. Great for Oranda, Lionhead, Azumanishiki, Ranchu and most other fancy goldfish. Regular feeding ensures desirable body structure and excellent appearance. Feeding Suggestions: When temperature above 50°F, feed two to four times daily. Higher temperatures cause more activity which requires more food. Please do not exceed the amount your fish will eat within a few minutes of feeding. Remove all remaining food after the feeding period to avoid over-feeding and the water quality problems associated with this action. Hikari Plankton is a pharmaceutically freeze dried food loaded with vitamins, offering superior nutrition and palatability. Ingredients: Fish meal, wheat flour, krill meal, soybean meal, brewer's dried yeast, spirulina, dried seaweed meal, rice bran, dried A. niger fermentation extract, monosodium glutamate, garlic, DL-methionine, choline chloride, vitamin E supplement, L-ascorbyl-2-polysophate (stabilized Vitamin C), inositol, calcium panthothenate, riboflavin, vitamin A oil, thiamine mononitrate, pyridoxine hydrochloride, niacin, menadione sodium bisulfate complex (source of Vitamin K), folic acid, vitamin D3 supplement, biotin, disodium phosphate, ferrous sulfate, magnesium sulfate, zinc sulfate, manganese sulfate, cobalt sulfate, calcium iodate. PLEASE NOTE: Handling a freeze-dried food that is derived from a live animal can cause the same allergic reaction possible by handling the live animal itself. To avoid potential problems, always wash your hands immediately after use and avoid contact with your nose and mouth prior to washing. Crude Protein - 48% min. Crude Fat - 3.0% min. Crude Fiber - 2.0% max. Crude Ash - 18% max. Saki-Hikari is synonymous with the world's highest quality and most efficient ornamental fish foods. Now your aquatic turtles can enjoy the same benefits koi, cichlid and goldfish keepers have come to love! The highly balanced nutrients and inclusion of the Hikari Germ support intestinal flora and immune system health. FEEDING: Feed once daily the amount your turtle will consume within a few minutes. In lower temperatures less food is required. Saki-Hikari TURTLE is most effective when used without interruption as a daily diet. The Hikari Germ is a transitory bacteria that does not remain in the intestine and is quickly discharged once feeding is discontinued. Intermittent use or mixing with other diets will not allow the Hikari Germ to offer its maximum benefit. Scientific diet for super-sized carnivorous fish. Large, easy-to-feed sinking pellets reduce parasite or bacteria transfer common with live foods. Nutritionally complete to offer higher levels of necessary vitamins and minerals. Great for large catfish. ReptoMin - trusted by pet owners world-wide, for over thirty years. Easy-to-digest formula is scientifically formulated with the latest nutritional and manufacturing technologies. Precise amounts of nutrients, calcium and vitamin C to support vitality and good health. GermGone is a ready-to-use, foaming hand sanitizer for use on reptiles, amphibians, baby birds and freshwater, marine or pond fish! Utilizing new dispensing technology, GermGone will eliminate 99.99% of the most common germs and reduce the chances of infection or illness transfer from or to your pets. Directions For Use: For adults, one pump dispenses a sufficient amount to completely sanitize hands. For children, reduce the amount as necessary. For most effective bacteria elimination wait for 15 seconds after use before handling herptile, birds or fish. Use of soap and water immediately after using GermGone will deactivate this product and should be avoided or reuse is required. Recommendations: Use GermGone before and after handling any reptile, herptile, bird or fish or for effective, non-drying and alcohol-free sanitation of hands any time. Eliminate the gooey, sticky, odorous conditions common with most other hand sanitizers on the market. Caution: Avoid eye contact. In case of contact with eyes, rinse immediately with plenty of water for at least 15 minutes. Do not add to water used for drinking by herps or birds. This product is a hand sanitizer and is not to be used as a disinfectant for cages, water or feed bowls, nor any other objects or devices used in herp, bird or fish keeping. Eliminates 99.99% of the following within 15 seconds: Escherichia coli, Staphylococcus aureus, Salmonella choleraesus, Salmonella typhi, Serratia marcescens, Psuedomonas aeruginosa. Ingredients: dehulled soybean meal, ground corn, fish meal, wheat middlings, fish meal, wheat germ, 0orcine animal fat preserved with BHA, poultry by-product meal, porcine meat meal, brewers dried yeast, DL-methionine, pyridoxine hydrochloride, tagetes extract, L-ascorbyl-2-polyphosphate, menadione sodium bisulfate complex, folic acid, cholecalciferol, calcium pantothenate, thiamine mononitrate, riboflavin, DL-alpha tocopheryl acetate, biotin, ethoxyquin (a preservative), vitamin A acetate, nicotinic acid, choline chloride, vitamin B-12 supplement, zinc oxide, manganous oxide, ferrous carbonate, copper sulfate, zinc sulfate, calcium iodate, calcium carbonate, cobalt carbonate, sodium selenite. Ruminant meat and bone meal free. 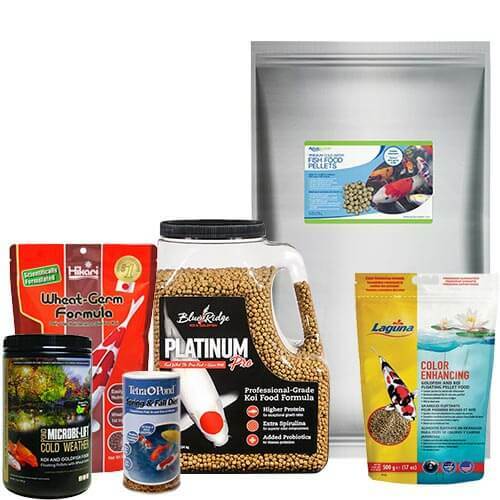 Blue Ridge Platinum Pro is a professional, fish meal-based diet formulated for discerning koi keepers that want the very best for their fish. This is a higher protein formula that will provide your koi with exceptional growth, nutrition and coloration. It contains everything needed to keep your fish in top show condition including top quality protein, carbohydrates and amino acids. It contains proven color enhancers Spirulina and Canthaxanthin for superior color enhancement. Also includes Primilac, a probiotic immune stimulant designed to protect koi from sickness and disease. Available in pest-proof 4.5 pound plastic jars and 14 pound plastic buckets with resealable lids. 60201 - Blue Ridge Floating Platinum Pro Fish Food 4.5 lb. 60251 - Blue Ridge Floating Platinum Pro Fish Food 14 lb. 60215 - Blue Ridge Floating Platinum Pro Fish Food 50 lb. Aquascape Premium Staple Mixed Fish Food Pellets are formulated for everyday use and provide your pond fish with the nutrition they need to thrive at an affordable price. The mixed pellet size provides small, medium, and large pellets, ideal for ponds containing a variety of fish sizes. All Aquascape fish foods contain probiotics that aid in digestion and reduce fish waste, while the high-quality protein included helps to optimize growth rates. The floating pellets contain stabilized vitamin C and other quality ingredients and are scientifically formulated for all pond fish, including koi and goldfish. Aquascape fish food will not break apart during feeding, helping to maintain clear water conditions. Floating pellet ideal for all pond fish. Specifically formulated to provide any newborn fish the exacting nutritional balance they require during the earliest developmental stages of their lives. High in superior protein sources, including premium-select fish meal, First Bites will help your newborns develop excellent body form, superior disease resistance and proper organ development. Give your fry the best chance at a long and healthy life, feed them First Bites! Small size avoids throwing away unused food. Resealable package for maximum freshness. For optimum results, feed daily as many times as possible, the amount your pet will completely consume within two (2) to three (3) minutes. Up to 10 feedings per day may be necessary depending on number of fry and activity level. For mid-water and bottom feeders allow Hikari First Bites to soak in a cup of aquarium water before feeding. This will cause the food to sink more rapidly allowing these fry better access. Livebearers (ovoviviparous) can consume Hikari First Bites right after birth. Start feeding Hikari First Bites right before the yolk sack is fully consumed. Care should be taken to avoid over-feeding. Excess food can cause water quality problems which may result in heightened stress or serious illness. Feeding less food to be sure none is left after the feeding period is preferred to allowing uneaten food to settle to the bottom of your aquarium. A scientifically formulated diet for larger top feeding fish, like arowana and other monster fish, that takes on a live-fish-like texture when put in water. An extremely flavorful, color enhancing diet with more balanced nutrient profile than live foods without the fear of parasites or bacteria issues. Food Sticks are a complete, nutritionally balanced formulation, developed for top-feeding carnivorous fish whose main diet of live food tends to cause nutritional deficiencies. Using Food Sticks instead of live foods reduces the chance of infection from parasites or bacteria found in most live foods. Ideal For All Carnivores. Developed to provide well-balanced nutrition and superior color enhancement of the natural colors of most larger carnivorous fish. Great for all types of freshwater fish, picky eaters! Color enhancing, daily diet for all types of cichlids and larger tropical fish. Great for oscars too! Hikari Cichlid Gold contains special color enhancers designed to bring out the natural beauty and proper form. We utilize the highest grade of ingredients formulated in exacting quantities to produce diets that will bring the brilliant colors of your fish to life! An excellent, higher protein, natural food for most tropical and select marine fishes. This highly flavorful treat in a freeze dried form is typically accepted by almost any fish it is fed. Our pharmaceutical-grade freeze-drying techniques allow us to give you a product as close to fresh blood worms as humanly possible. Expect color, texture, and taste not previously available in a freeze-dried food. Superb krill offering natural astaxanthin and higher marine proteins too. Our pharmaceutical-grade freeze-drying techniques allow us to give you a product as close to fresh krill as humanly possible. Expect color, texture, and taste not previously available in a freeze-dried food. The world’s 1st probiotic enhanced blood red parrot diet. Free of any hormones and formulated with a number of natural color enhancing ingredients, expect outstanding form and superb coloration. Best of all the highly digestible ingredients along with the inclusion of our Hikari-Germ help reduce waste and thereby help improve water quality with continued use. Higher levels of Pure-Cultured Spirulina and precise amounts of carefully selected carotenoids offer coloration you have to see to believe. The readily digested, premium-select ingredients provide immune system support and great taste too! A professional use, daily diet offering "Hikari Germ" our proprietary probiotic and aggressive color enhancing capacity for all types of premium-grade or fancy goldfish, especially Ranchu.